What do you call bicycles, lots of them, with spandex-garbed riders proceeding up an down the hills in groups? Well, in a race, that might be a peloton, a pack or riders vying for position, focusing on every advantage, marshaling their resources for the possibility of a break-away. However, there’s something different about these ‘cyclists. They don’t have the carved muscles gained from hour after hour of pedaling day after day, year after year. The spandex is bright and colorful but what are those bulges that some of the racers carry around waist and thigh? No! Surely not…could it be? Yes. Rolls of adipose tissue. Fat, in common terminology. Who are these middle-and-older aged folks promenading up and down the streets and highways, two and three abreast, seemingly oblivious to the two-ton pickup trucks and ton-and-a-half cars that are shooting by with inches to spare as they pass? 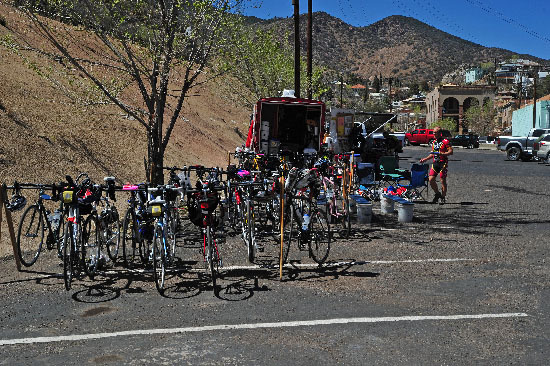 They’re touring riders, bicyclists who are are accompanied by sag-wagons, vans with food and drink and the occasional task of scooping up bike and rider who have exceeded their capabilities. This is not a race. It’s a pleasure jaunt. These guys and gals aren’t preceded by a state trooper or a county deputy with lights flashing, warning drivers that an event is taking place. The tour operators don’t apply for permits to use the roadway for a race. The riders should, by both reason and law, adhere to the same vehicular codes that any other bicyclist is supposed to obey. One of the important ones: stay to the right of the road as far as practicable. That’s a law specifically written to apply to bicycle riders. It’s common in most states. Stop signs mean stop. In the case of a bicycle, slowing to check traffic, proceeding at a safe pace once the rider has ensured there’s no traffic, is (in my tiny mind) both prudent and safe. Blowing past the sign as if there’s no possibility of causing an accident (or maybe ending up as fleshy-colored gravel under a set of truck tires) is not just imprudent…it’s insane. For the past few days I’ve watched these touring riders struggling up a six percent grade, two and sometimes three abreast barely at a walking pace, ignoring the cars whizzing by with barely any clearance. I’ve seen the riders swerve in front of traffic in town and blow through stop signs as if the rules only apply to other people. I’ve watched them toss candy wrappers over their shoulder as if littering is their right. Many–not all, but many–of these people are rude. They park their bicycles in the path of people walking along the sidewalk as if they’re Hardley-Ableson riders outside a Starbucks. And, like the Harley riders glaring at anyone who comes close to touching a motorcycle parked where it shouldn’t be, these riders think other people should avoid their spindly bikes by at least a few feet. I like bicycles. I’ve been riding bicycles for most of my life. I raced, I was a USCF official for several years. I still throw my leg over the frame and ride 15 to 20 miles a day two or three times a week on a mountain bike. I stop for stop signs. I don’t toss my detritus on the street. I don’t challenge cars to run over me. I’m not a nice person and I don’t deserve nor desire thanks for obeying the law. I want to continue riding without those tell-tale car tire tracks on my arms and legs. I don’t want to offend other drivers. That way, the other driver is more likely (at least in theory) to give me a minuscule bit of space here on the highway of life. And I don’t appreciate the rude, oblivious to the rest of the world, riders who will leave a residue of distaste in the mouths of people who already dislike bicycles. After these tourists leave, I still ride my bike here and I get to contend with the aftermath of the visit.